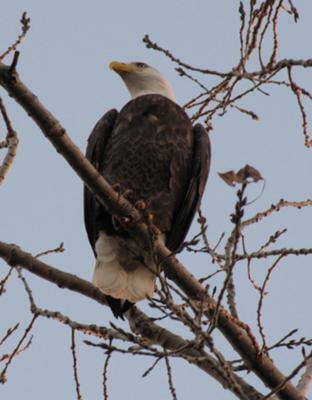 While driving home from Sarnia on November 14th 2009 along Melwood Rd just east of Case Rd (near Strathroy, ON), my husband spotted a bird in the trees that he thought was a Bald Eagle. We almost didn't turn around to go back to check! It was after 4:00 in the afternoon, so I asked my husband to drive past the bird and turn around so the light would be shining on the eagle. We opened the sun roof, and this is the picture I got with my Canon SX10 - which I have owned for just 24 hours! The bird was in the top of the trees - the zoom on this camera is amazing! Wow, what an amazing picture - I'm so glad you bought a new camera!